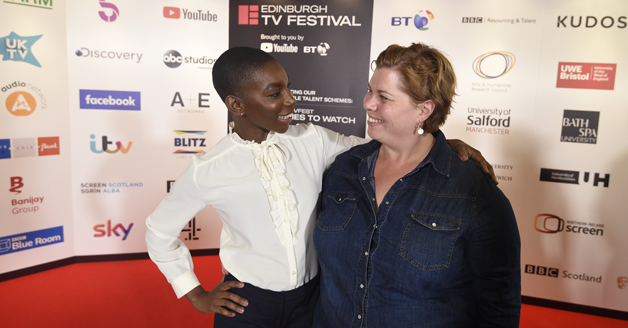 The UK’s top TV bosses were dealt something of a yellow card at the Edinburgh TV Festival as Chewing Gum’s Michaela Coel used her prestigious MacTaggart Speech to provoke and challenge a “faulty” industry, urging execs to examine how they operate. In a powerful and emotional lecture the BAFTA winning writer and actress drew on personal experience to call out racism and sexual harassment in the industry, challenging the 2000-strong audience of TV execs and producers to do more to ‘make misfits feel at home’ in the industry. “The lack of varied perspective among producers, the lack of misfits producing telly can have catastrophic consequences” Coel warned. Coel is the youngest person and first black woman to ever give the Festival’s keynote speech and calling herself a ‘misfit’ she said no-one really understands what ‘diversity’ means, it’s just a ‘buzzword’. Her metaphors are poetic, raw and emotional, she described not minding the faint taste of cement on the sweets she and her friends scrambled for on the floor as children when a boy would throw them from his window. Having to endure that slight taste of cement, in even in the sweetest of victories, the biggest of breakthroughs and most prestigious of wins, was certainly a thread in Coel’s MacTaggart speech. Coel described the consequences of “thoughtlessness’’ onset when a group of five black actors were made to share a trailer while the white actress had her own. “You know what this looks like don’t you?… A slave ship?” she recalls screaming at producers at the time. Coel warns such mistakes could be avoided if people were just aware enough to spot them, but a lack of diversity from the top down inhibits this. Another example of racism involved filming abroad when a group of men attacked Coel and a co-star, throwing stones at them. She questioned whether such traumas could be evaded if there was more diversity among execs who might think filming in certain territories is a “low cost haven. They didn’t consider the experiences of the brown and black cast to meet the morals of their diversity compass, because they didn’t think to see things from our point of view” Coel said. Seemingly along with every actress and writer in entertainment, Coel shared an experience of harassment, recalling when she won her first big industry award, but was undermined and totally floored when she was sexually propositioned in the most inappropriate way by an exec at the after-party, only to go home in tears. In her speech she pondered: “Could my silence have encouraged this producer to push boundaries with women and people of colour further? This thought is uncomfortable” she admits. In another hurtful take down, Coel described the contents of her gift bag having just won that award and how they made her feel even more like an outsider: dry shampoo, tanning lotion and fair skin foundation. Most emotional and worrying in the lecture, was Coel’s struggle with what happened when she was sexually assaulted. Coel made clear her attacker had no links to the TV industry or the production company she worked for, but her point; if we are not honest, open and transparent, how can we handle emergencies, and how can we ensure that the industry is doing its best in its duty of care to its talent and employees? Stressing how being open about her experiences is therapeutic, Coel urged the audience to also be transparent, and to seek help when needed. In something of a mini life story, Michaela also talked about the block of East London flats she grew up in with her single mum, being bullied at school, and the racial abuse she faced at theatre school. There was no hint of a sob story here though. Coel’s striking and unwavering sense of humour, hope and vision ensuring an inspiring message. I personally found this speech – possibly the most brutal, honest and provocative in the 43-year history of the prestigious MacTaggart lectures – extremely refreshing. Most who ‘make it’ don’t dare speak out about the skeletons in the cupboard, they don’t dare rock the boat for fear of falling from the glorious ship that is Showbusiness. Almost a year since the Weinstein scandal broke, there is a danger the new-found momentum of transparency, speaking out, refusing to be complicit will be lost, unless people like Michaela Coel continue to dare to be open and honest. 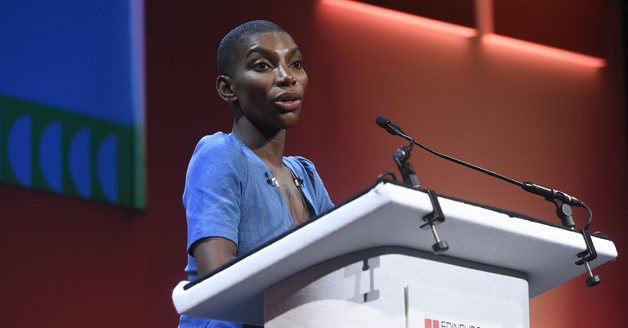 But were the execs at the Edinburgh International Conference Centre listening to Michaela Coel? Do they get it? What will they do to make the ‘misfits’ feel at home? To better nurture and protect talent – especially people from more diverse backgrounds in an industry still run by predominantly white, middle aged, middle class men. The fact that Coel was even chosen for the MacTaggart this year – a speech usually reserved for industry veterans (with previous speakers including Jon Snow, James Murdoch, Jeremy Paxman and Armando Iannucci) was an important development for the industry. Whether or not most of the room could truly identify, or even felt comfortable with some of what she had to say, her voice is indisputably powerful and exhilarating. Brace yourselves people for more Michaela Coel.